Have you ever wondered what kinds of materials you can cut with a Cricut? There are so many differnt things that you can cut. I have a few favorites that I cut all the time, some I use from time to time, and some that I have yet to try. In this post we are going to talk about those different materials and I am going to share a really quick and fun project that I made with some new materials that I tried out. What Can I Cut With My Cricut? Glitter Vinyl- So fun and sparkly, perfect for projects for little girls, or anything that needs a little sparkle. Adhesive Foil- Adhesive Foil is great when you want some extra shine. I will be sharing a project in a couple of weeks that uses this. Outdoor Vinyl- A little heavier than regular adhesive vinyl, this is great for projects that will be outside. I actually used this on the Easter Buckets I made. Holographic Vinyl- Super shiny and changes colors, I used it for my Follow Your Dreams Sign. 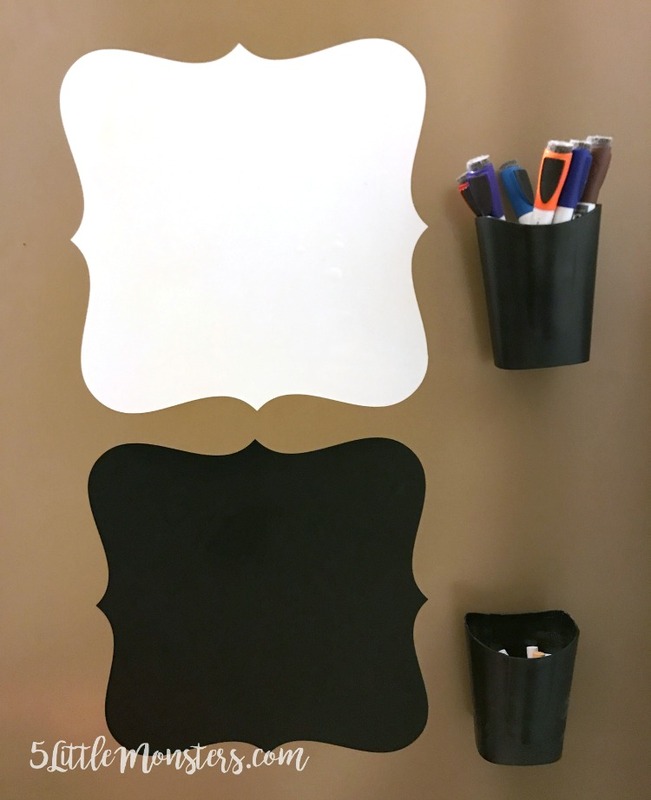 Chalkboard Vinyl- A fun way to add chalkboard surfaces to different things, I have added labels to jars and I use it for the project in this post. Dry Erase Vinyl- Also used for the project in this post. 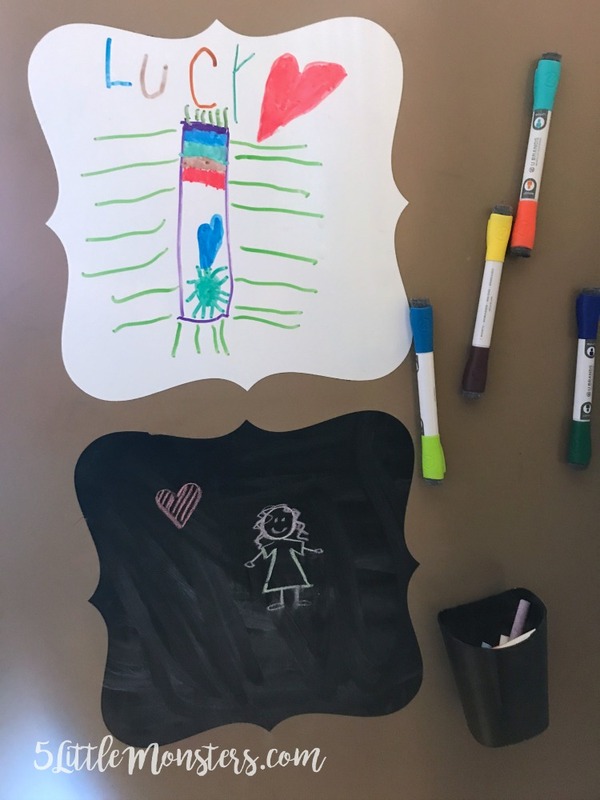 Add a dry erase surface to your project. Stencil Vinyl- Great for making stencils. I used this on my Follow Your Dreams sign. Printable Vinyl- Printable materials are pretty cool, you can use the print then cut feature or add a pattern to your vinyl. I just recently got some of this in the mail and am excited to make something with it. Iron On- I love using Iron on. It is so fun for t-shirts and onesies, bags, pillows, and anything else you can think to iron something on to. You can customize anything and like adhesive vinyl it comes in lots of colors as well as a few other varieties. Glitter Iron On- Again, the glitter version is great when you want to add a little sparkle to your project. I have used it several times like on the Christmas shirts I made for my girls. Holographic Sparkle Iron On- This one I have not tried, it looks pretty sparkly. I think it would be neat for a 4th of July project. Foil Iron On- I really like the foil iron on. I have used in a few times like my daughter's Unicorn Pillow and Unicorn T-shirt. I have another project I am working on and will be sharing soon. Printable Iron On- This can be used the same way as the printable vinyl. I have only used it once at an event that I went to. It was pretty neat and I have some and I am looking forward to trying it out in my own project. Cardstock- I have used cardstock quite a few times, mostly for cards (like these) and tags (like these), but there are lots of things you can use cardstock for. Paper- Similar to cardstock as far as the types of projects. I don't do a lot of paper crafts so I haven't used paper many times. I feel like this is one you would use a lot in scrapbooking and other similar types of crafts. There are lots of different types of paper you can use too. Party Foil- This is a newer product but it looks like it would be a fun way to add a little shininess to your party decor. Craft Foam- This is one that I have not yet tried but I think it would be great for kids projects. Faux Leather- I have used faux leather a couple of times, like for these hairbows. It is much thinner than leather so it cuts easily while giving you a leather type look. Leather- I have not yet tried actual leather but if you do you will definitely want a deep cut blade. Vellum- Again one that I haven't tried, but there are lots of ways you could use this with paper crafts, cards, invitations, etc. Sticker Paper- Printable sticker paper is fun for making your own stickers. This would be great if you use planner stickers, you could make your own. 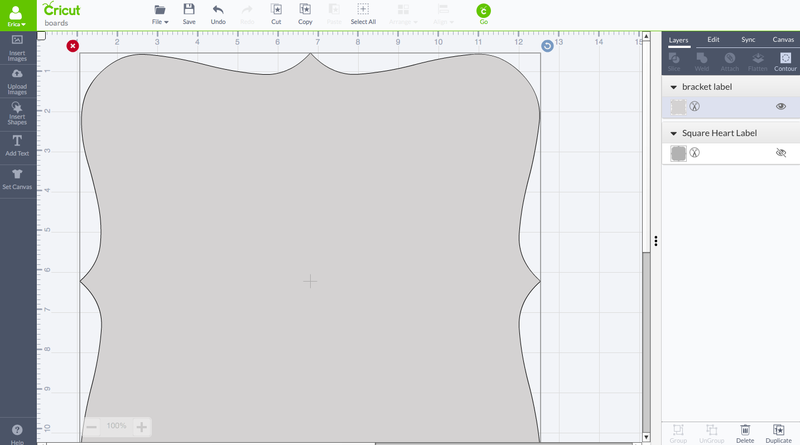 Fabric- Most types of fabric will need to be bonded in order to be cut on the Cricut. You can add a stabilizer to it and then cut out the shapes that you want. Some heavier weight fabrics like Duck Cloth or Canvas may not need the stabilizer. Felt- If you are going to cut felt I think you need to use a nice wool felt. I tried cutting cheap craft felt one time and the results were pretty disatrous so I wouldn't recommend that. I have heard of people having good results by adding a lightweight stabilizer so that may help. Also, I didn't use a deep cut blade which also would have probably made a difference. Poster Board- I have used posterboard a couple of times, you can get it in quite a few different colors for lots of different projects. Washi Sheets and Washi Tape- I haven't tried this one yet but I just ordered some Washi Sheets for a project I have planned for next month. Window Cling- Another material I haven't tried but it looks like it would be a lot of fun for kids. 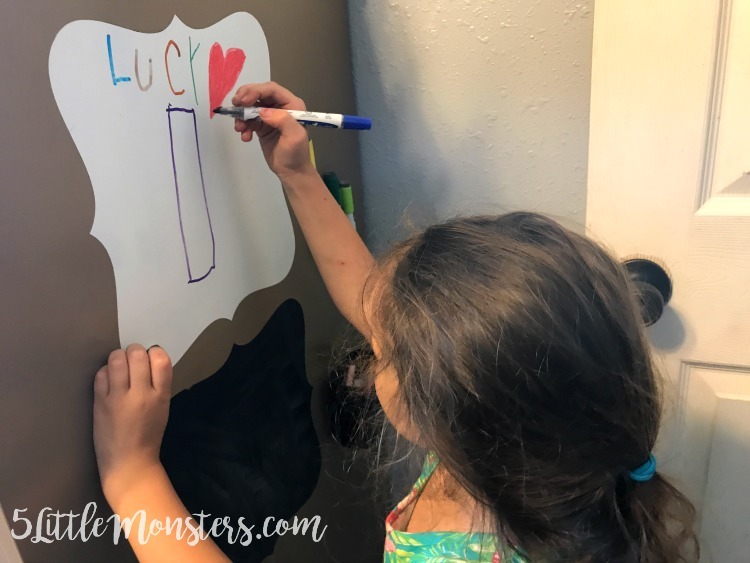 Magnet Sheets- I haven't tried this but you can get both a regular and printable version. Aluminum Foil and Aluminum Metal- I think this is one of the stranger materials that can be cut with the Cricut. I'm not totally convinced it would work, at least with the foil, but it is on the list of approved materials that can be cut. I might have to try it out to see how well it really works. It could be interesting. Freezer Paper- This could be great for stencils that you are going to use on fabric. Chipboard and Thin Cardboard- You can cut things like chipboard, art board, cereal boxes, etc. Post it Notes- I always see this pop up when I use the custom settings and I think it is interesting. I'm not sure what you would cut out of post it notes but if you think of something you can do it. Imean, it makes sense since they are really just paper but they do have their own custom setting. Soda Cans- This is probably the the strangest thing that you can cut. Again, I'm not sure what you would use it for but it could be kind of cool. I guess what it comes down to is that it is just a thin enough metal to cut. Wood Veneer and Balsa Wood- These ones were also interesting to me. I really want to try it out. You will probably want to use a deep cut blade for this as well, especially for the balsa wood. ... and more- There are even more things that you can cut but this is a pretty good sampling of materials. You can find a complete list on the Cricut website. Now on to today's project. This was a super simple project, it literally only took minutes from start to finish, and it is something that gets used all the time. 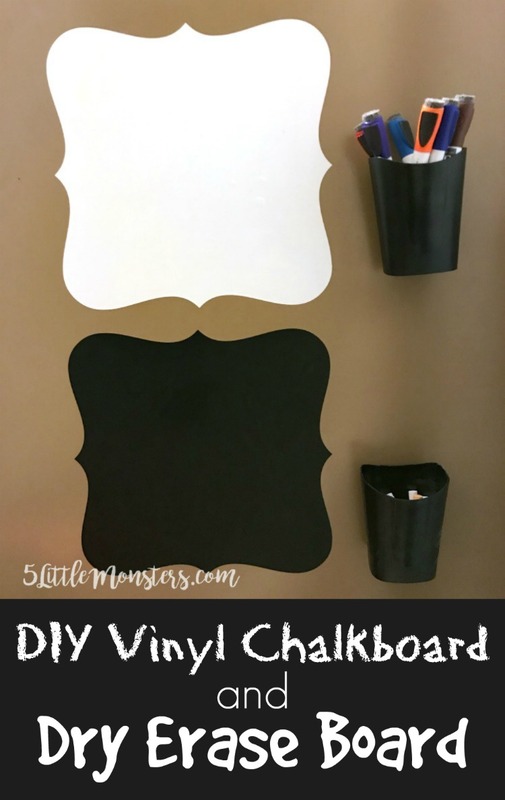 All you need is some chalkboard vinyl and/or dry erase vinyl. We recently got a hand-me-down filing cabinet to put in our office. We stuck it right next to my desk but it sticks out a little further than the desk so on one side there is a pretty large space next to the side of my desk and on the other side the whole side of the filing cabinet was showing. 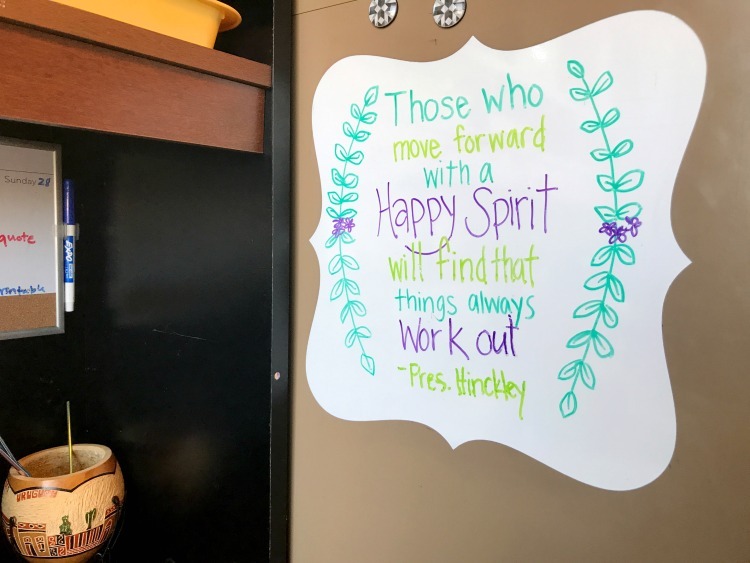 I had been wanting a whiteboard next to my desk that I could write quotes and things on and the side of the filing cabinet gave me the perfect smooth surface. I also had been wanting to create a little corner of the office that the kids could keep entertained in there with me while I am working. The other side of the cabinet was the perfect place for that. I was able to add a chalkboard and a whiteboard to that side and now if they want to be in there while I work they can draw on either board. It was the perfect solution for both me and the kids. The first thing you will need to do is design your board. You could make it any size or shape that you want, just keep in mind that you can only cut so wide. If you have a long mat you could make it longer but I decided to make mine a square. I didn't want just a boring plain square though, I wanted something a little fancier. I found that if you want a good square or rectangle shape with decorative edges you should search for LABEL in design space images. 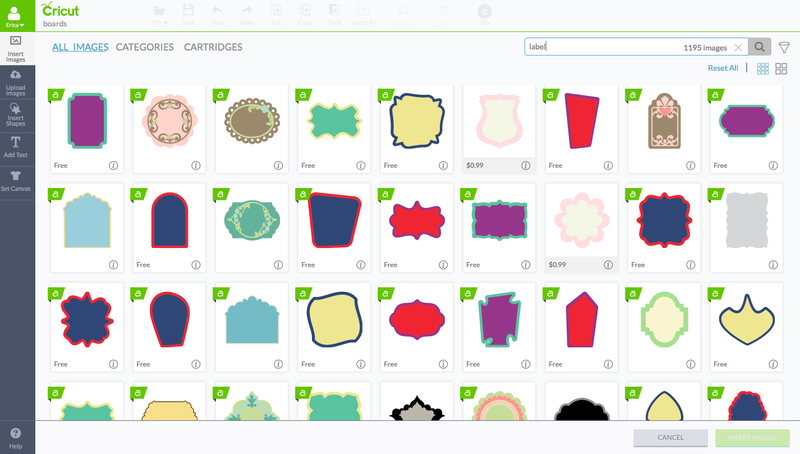 So many options will come up, squares, rectangles, circles, ovals. Several were free shapes and most were free with Cricut Access. Pick the shape that you want and add it to your project. Once you have your shape all you need to do is size it to the desired size. I made mine about 11 1/2" square which was as big as I could make it considering he fact that both my cutting area and my material were 12". Then cut out your shape, carefully peel off the backing and adhere to desired location. Make sure you pick somewhere nice and smooth to stick it. Then just start writing or drawing. I also made little marker and chalk holders to add to the kids side. I picked up some inexpensive and lightweight pencil cups at the store and glued some large magnets on the back (I put 2 large magnets on each cup). Then I filled one with dry erase markers and the other with chalk and stuck them to the side of the filing cabinet. This worked great since we put the boards up on a metal surface, obviously if you are using a different surface you would need to come up with a different solution. This was a super simple, quick, and useful project. One that gets used everyday in our house. Not bad for a project that took minutes to put together. Who knew they made chalkboard vinyl!? I love this idea!